Premises Liability Attorneys Seminole FL | DeLoach, Hofstra & Cavonis, P.A. Have You Been Hurt on Someone Else's Property? Property owners have a duty and responsibility to maintain their premises safe and secure from any hazards or dangers that might cause injury. If public areas are not properly maintained it could result in injury. Things like proper lighting, roof leaks, and stable floors can cause an injury resulting in the victim being unable to work temporarily or permanently. If the property owner is experiencing problems such as a floor that is wet due to a leaky roof, they are responsible for alerting the public that the floor may be slippery. If you were injured and there was no warning of the property's bad condition, they may be liable. It takes a skilled, experienced lawyer with significant resources available to conduct a thorough investigation to obtain the needed information to successfully resolve a Florida premises liability case. Preserve all available evidence by taking photos, if possible, of the scene and any visible injury you have. Premises liability is a general term used to describe a variety of incidents involving an injury occurring on a property. These incidents can be anything from a criminal attack to the more common "slip and fall." Broadly speaking, a property/business owner owes two primary duties to those who are legally on the property. First, there is a duty to maintain the property in a reasonably safe condition ("duty to maintain"). Second, there is a duty to warn of any latent or concealed hazards that the owner knew about or should have known about ("duty to warn"). Contrary to what many think, the mere fact that someone is injured on another's property does not make the owner liable. The person claiming an injury must prove the owner breached one of the above duties. The duty to maintain a property in a reasonably safe condition is a general duty owed to all those who are legally on the property. The owner can satisfy this duty by using ordinary care to maintain the property. An owner who acts prudently by timely correcting potentially dangerous conditions like tripping and slipping hazards has fulfilled this duty. An owner who fails to correct these potentially hazardous conditions is liable to those who are injured by them. 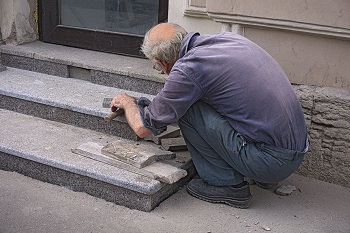 Common conditions requiring correction include broken and uneven walking surfaces (tiles, sidewalk, etc. ), poor lighting, dangerous animals and criminal activity. The duty to warn of a latent or concealed hazard arises when an owner actually knows the hazard exists or should have known the hazard exists. The hazard is considered latent and/or concealed if it is not readily observable to a reasonable person under similar circumstances. For example, a clear, slick liquid on a tile floor may not be "readily observable". An owner who should have known about a hazard is deemed to have "constructive knowledge" of the hazard. An owner has constructive knowledge when a hazard has existed for a sufficient amount of time or occurs with sufficient regularity. For example, if the clear, slick liquid from our earlier example remains on the floor for 20 minutes, the owner may be deemed to have constructive knowledge of it since it was on the floor long enough for the owner to have discovered it. For an additional example consider the owner who sells a product that is commonly dropped on the floor by customers (unpackaged fruit, items sold in bulk, etc.). If this occurs with enough frequency, the owner is deemed to have constructive knowledge regardless of how long the items are on the floor. Keep in mind that the physical abilities of those who regularly enter the property have an impact on the above duties. For example, if an owner has a business that regularly attracts elderly customers, the owner may need to take additional precautions to keep the property safe for those with problems with vision and/or mobility. Those who operate a business involving children (daycare center, arcade, etc.) must take into consideration the immaturity of those children. A little common sense goes a long way in keeping a property reasonably safe. Using good judgment and applying the "golden rule" makes for a safe property. For those other properties that cause injury, give me call. A property/business owner owes two duties to those who are legally on the property. First, there is the duty to maintain the property in a reasonably safe condition. Second, there is the duty to warn of any latent or concealed hazards that the owner knew about or should have known about. Note that the above duties apply when someone is legally on the property. For example, guests in your home or customers in your place of business are legally on the property and are owed the above duties. Since the above duties apply to those who are legally on the property, the general rule is that they do not apply to trespassers. The "attractive nuisance doctrine" is an exception to this rule. Broadly speaking, the attractive nuisance doctrine imposes liability on a property/business owner when a trespassing child is lured or attracted to the property by a condition which causes an injury to the child when: the condition is inherently dangerous; the property/business owner knew or should have known the condition is in a place where children will likely trespass; the child does not discover the condition or realize the danger because of the child's age; the property/business owner fails to exercise reasonable care in removing the danger or protecting the child; and the burden of eliminating the danger is slight compared to the risk to children. Examples of an attractive nuisance include a house under construction (e.g. stacked cinder blocks, pile of sand and stack of lumber); abandoned or discarded refrigerators, washers, dryers or similar airtight boxes, a swimming pool or other artificial body of water where they are constructed in way as to constitute a trap or where there is some unusual element of danger; and derelict playground equipment. The age, knowledge, and experience of the child are important factors to consider. For example, a 14-year-old who works part-time at his families' appliance repair business will appreciate the danger of a discarded refrigerator, where a 6-year-old will not. If the child discovers the dangerous condition or appreciates the danger, the attractive nuisance doctrine does not apply. If the initial reaction to a condition is one of concern that it might pose an unreasonable danger, it probably should be corrected. If you have been hurt on someone else's Florida property due to their premises liability you may be wondering how to deal with the time off of work and health care costs that have resulted. If you would like to speak to an experienced Tampa Bay area premises liability attorney to see if you may be eligible for financial compensation, contact DeLoach, Hofstra & Cavonis today. You should know that when you work with us you are not responsible for any of our fees or costs unless there is a recovery. We pay all of the initial costs necessary to doggedly pursue your claim. Get help today by calling 727-397-5571 to contact a Florida premises liability attorney in the Tampa Bay area.